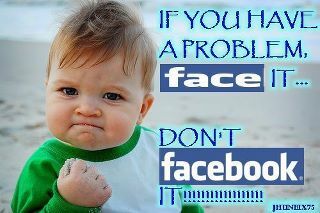 “When you have a problem, face it, don’t Facebook it.” – this is just a joke that’s been making its rounds through Facebook for who knows how long, but there’s real wisdom in it and it would do people really well if they could take it to heart. Too many people have lost their jobs over a comment that they later regretted, a comment that would have meant little had they said it somewhere else and not on Facebook. In fact, over the last 12 months, more than 100 people in the US have been accused of improper behavior online by their employers, whereby they sometimes got suspended, denied of a promotion, or outright fired. Getting in trouble over a Facebook post is but one of the many problems that are cropping up in today’s modern world because of people’s increasing involvement with social media. The best way to combat it is to prevent it from happening in the first place and to keep your online persona as squeaky clean as possible. However, once the deed is done, there’s usually little that people can do by way of defense – hence the number of pink slips getting handed out. But that doesn’t mean it’s hopeless. Recently, people have found a solution to the whole ‘getting fired over a Facebook post’ dilemma which, ironically, they found in the past, particularly in the National Labor Relations Act of 1935. The law basically gives people the right to complain about their working condition, such as their pay, their work hours, and their safety. However, not all complaints fall under this category. According to the National Labor Relations Board (NLRB), only about half of the reports they receive can be covered by the act. However, those that do have merit usually earn the attention of the NLRB, who then intervenes on behalf of the employee. The dilemma now is how to determine whether your post falls under the protective umbrella of the law or not. According to the NLRB, simply griping about your workplace won’t get you support from their institution. However, if it’s a group complaint, then you’ve got a bigger chance of getting the NLRB’s backing, whereby it will be called “protected concerted activity”. There’s also a bonus if the post was written with the intention of improving the working condition in the employee’s respective workplace. Name-calling is also fair game, although it would depend on the context by which the word is used. But if you add any sort of threat – physical or verbal and regardless of whether you mean to carry it through or not – then your workplace could legally suspend or fire you.